One of the first things you will notice about this restaurant is the location. Nestled snugly up against the cliffs, this place offers a one of a kind dining encounter. From the deep depths of color to the cascading waterfalls, I can’t imagine a more delightful way to enjoy a meal. You have a couple different options as far as seating goes, you can sit in the formal dining room, which has its own brand of elegance and tamed lighting, or you can dine cliffside out on the patio. I chose the latter, and found myself immersed in nature and sophistication. 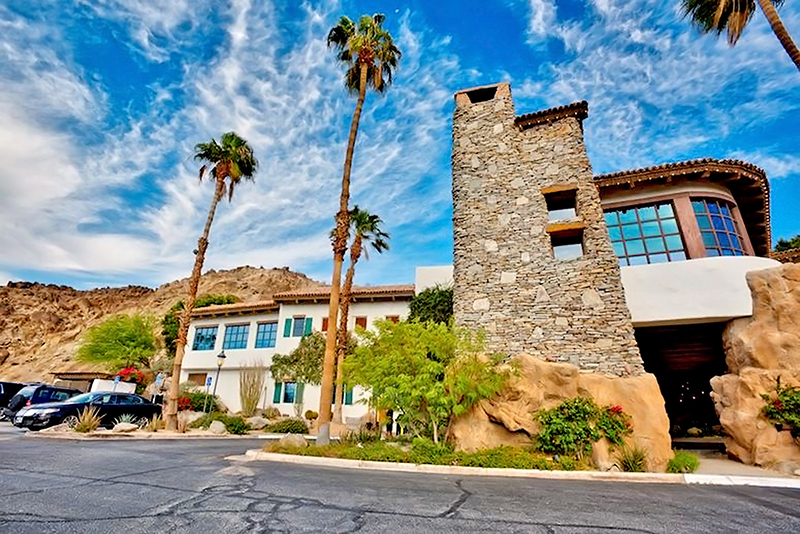 Crisp clean linens embellish all surrounding tables and plenty of heaters set up on the patio to ensure you are comfortable in the brisk desert evenings. 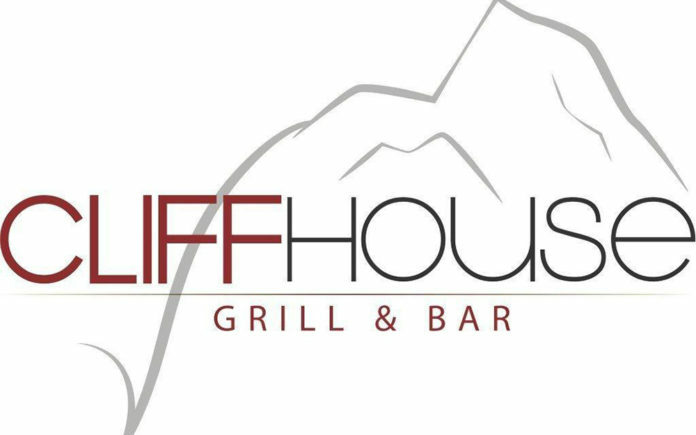 Happy hour is Monday – Saturday 3:30 to 6:30 and 3:30 to 9:00 on Sundays, with an award-winning wine list and splendid cocktail options, the La Quinta Cliffhouse has you covered. 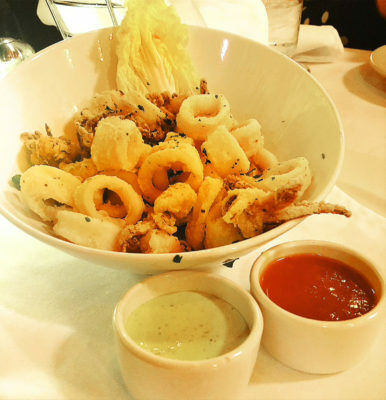 Diving right into the menu, we ordered up the crispy calamari and pork belly for our small plate starters. 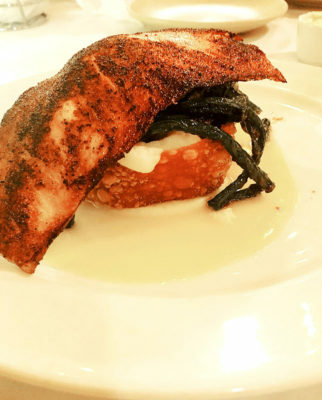 Notable service and timing of the delivered plates throughout the meal was exceptional. The calamari arrived beautifully plated and alongside two different sauces, one being a spicy Vietnamese, and the other a rich, cool, calm and collected jalapeno-buttermilk aioli. Remarkably cooked, the exterior of the calamari was crispy and luscious, the interior being the most tender and delicate calamari I’ve yet to come across. My sister, who lives about five minutes from the beach, could not believe just how fresh and stunningly delicious they were. Now for the next plate, I can tell you one thing about pork belly, it can be very difficult to cook. I know for a fact that time and patience goes into this dish, and the chefs here at The Cliffhouse know exactly how to execute. 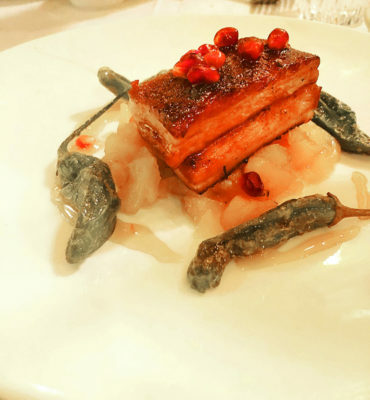 Two succulent pieces of belly are sat neatly upon juicy, fork-tender apples, topped with vibrant pomegranate seeds, and surrounded nicely with roasted shishito peppers. For the entree portion of my meal, I sampled three dishes from The Cliffhouse kitchen. All three dishes were nothing short of astonishing, be it that they were all very different styles of cuisine, I can easily say this restaurant can deliver on all levels. First up was the sugar-spiced salmon, right off the bat, plating of this dish is superb, unlike any salmon dish I’ve seen before. A pool of mustard sauce sits at the bottom, next a crispy, crunchy wonton ring is filled with creamy garlic mashed potatoes, Chinese beans, which were tossed in a full-bodied umami sauce, atop of all this sits a perfectly cooked piece of succulent, flaky salmon. Next up was the hand rolled gnocchi, another dish that takes time and patience to execute. The gnocchi was extremely well prepared, swimming in a splendid, jam-packed meat bolognese, covered in parmesan cheese, this plate was greatly balanced. Last but not least was the November special, surf and turf. The 8oz. filet mignon was seared to perfection, the lobster tail was nothing short of amazing, drawn butter, garlic mashed potatoes and steamed vegetables accompany this long-lived duo. 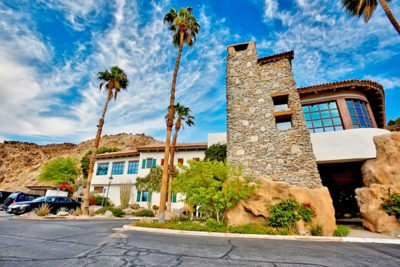 I would highly recommend anyone that is looking for a guaranteed, over the top dining experience to reserve your table at the La Quinta Cliffhouse. Staff here know exactly how to treat their guests, paying close attention to detail and making sure your experience is well taken care of. Whether you jump, dive, or climb your way into The Cliffhouse, once you arrive, you know you’re in for a real treat.